The Exerpeutic TF1000 Walk to Fitness Electric Treadmill is an effective way to burn extra calories and achieve a healthy lifestyle. Walking on the Exerpeutic TF1000 is among the easiest and most effective ways to achieve a regimen of regular exercise. Unlike outdoor walking, treadmill fitness walking has the benefits of shock absorption and the convenience of exercising in your own home, in front of a TV or just listening to your favorite music. Walk to Fitness can help you lose body fat, tone muscles and is a great way to stay in shape. As for assembly the Exerpeutic TF1000 is virtually assembled out of the box. Attach the computer and you are ready to go! 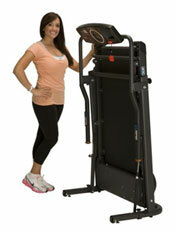 So go ahead and take a look at the Exerpeutic TF1000! It can take the punishment! The Exerpeutic TF1000 has been tested up to 400 lbs user weight, allowing you to walk your way to fitness at any age and body size. It comes with a 1.5 Horse Power High Torque Motor. The motor utilizes “Quite Drive” which reduces any noise when walking so that there is not any sound interference with your TV or music. Speed adjusts in increments of 1/10’s mph up to a maximum of 4mph. The treadmill belt has been widened to a fitness club size of 20” for safety and security in conjunction with Extra long 18” safety handles that are 2x the standard length. The frame has been reinforced to accommodate a high weight capacity capability with wide side rails for a foot platform, if needed. Speed keep an eye on buttons and on/off buttons are on the handle bars for convenience. Folds up easily for storage and can be wheeled around. The LCD display window features elapsed time, distance walked, calories burned, speed and pulse monitoring. With a 5 year Warranty: 5 Year motor warranty, 1 year frame, 90 days parts and labor how are you able to go wrong? The TF1000’s folding frame makes it easy to store and transport. The more you walk, the better you can feel, as walking on a treadmill is easier on the knees than outdoor walking (less affect than a sidewalk) whilst helping you lose body fat, tone muscles, and fortify your cardio fitness. The TF1000 is equipped with a 1.5-horsepower high-torque motor and a “Quiet Drive” system that reduces walking noise. As a result, the TF1000 is ideal for folks who want to work out without waking the kids or drowning out the TV or stereo. The treadmill is also safer than many home treadmills thanks to the 20-inch-wide treadmill belt–the same size found in most fitness clubs–and the extra-long 18-inch safety handles, which are two times the standard length. Construction-wise, the TF1000 includes a reinforced frame that’s been tested for a user weight up to 400 pounds, in conjunction with wide side rails that acts as a foot platform if necessary. It’s also easy to track your workout progress via the LCD display, which monitors your elapsed time, distance walked, calories burned, speed, and pulse. And you easily move the treadmill just about anywhere, as the TF000 includes a folding frame and bottom wheels. The TF1000 carries a five-year warranty on the motor and frame and a 90-day warranty on parts and labor.